IOGEAR's super flexible Charge n' Sync cables meet or exceed OEM cable standards for performance without being stiff or difficult to coil. High-grade materials enable thinner construction, and make for a non-bulky, tangle-free cable. 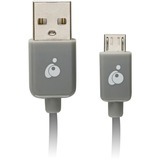 Great for items such as smartphones, tablets, cameras, video game controllers, e-readers (Kindle, NOOK, etc.) and GPS units. Micro USB is now the international standard for charging and data exchange for most handheld mobile devices that do not have an Apple logo.